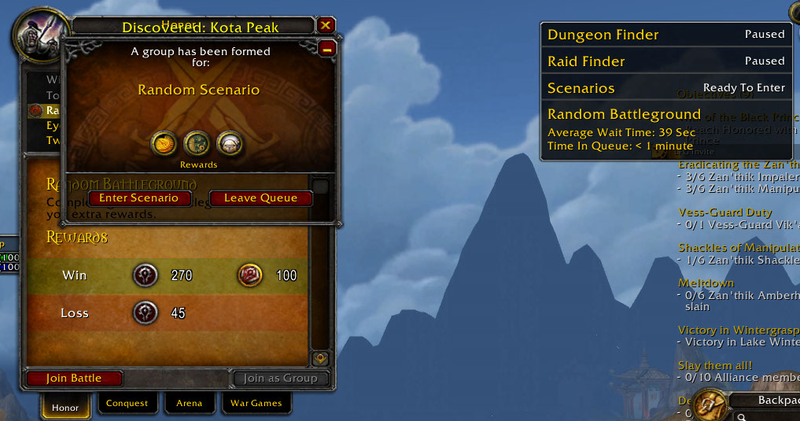 If you're doing the item upgrade grind and don't feel like doing dailies, it's a good idea to queue for Scenarios, Dungeon Finder and Raid Finder all at once. I mentioned yesterday that Scenarios now have a chance to drop epics. 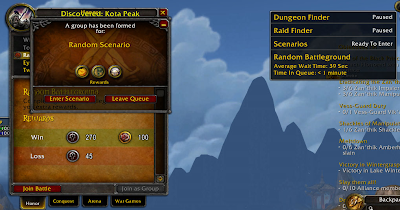 Once a queue pops your other queues will be paused, as soon as you finish whichever thing you were doing (most likely a scenario), you'll be placed at the front of the line for your other queues, so you pretty much get into a Dungeon or Raid after your scenario immediately. It works for PVP too, but your queues will drop if you get into Wintergrasp or Tol Barad.